Equitone natura has created a striking and visionary aesthetic on the new £9.9m Northern Design Centre at Gateshead Quayside. Equitone is the new international brand for Marley Eternit’s architectural facade materials and brings together the ranges natura, tectiva, pictura and textura. Red Box Design Group specified Equitone because its tactile, smooth, semi-translucent surface, which allows the natural variegation of the fibre cement to show through, helped deliver their vision of creating a building that ‘exudes a sense of innovation’. The material is available in a wide choice of colours as well as an optional ‘Pro’ coating to give additional protection against staining and graffiti. 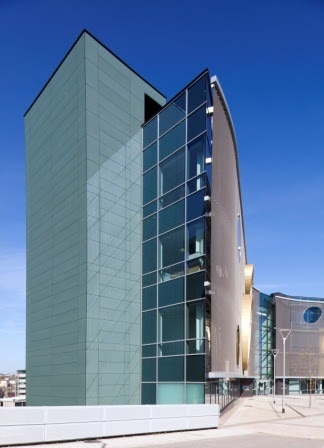 Charcoal and Sage Equitone natura were used to create the architectural facade because it created a striking backdrop to the ‘gold Tecu’ clad tubular windows that project out of the front of the building. Fixing the facade panels to an aluminium support frame using a structurally bonded adhesive as part of a secret fix system helped maintain the sheer smooth aesthetic of the facade. Along with aesthetics, low maintenance was an essential requirement and Equitone natura was used because, being made from fibre cement, it has an installed life expectancy of at least 50 years with minimal maintenance. said Mike Dixon of Red Box Design Group. The four storey BREEAM Very Good rated building was constructed using a structural steel frame system and blockwork walls. The aluminium rainscreen cladding support system and 85mm of high performance insulation were then fixed to the exterior of the block walls. The rear ventilated cavity was created by structurally bonding the Equitone natura panels to the aluminium frame to provide the building with enhanced performance benefits. An Equitone fibre cement facade can contribute to an A+ rating as defined in the BRE Green Guide to Specification based on generic rating for autoclaved fibre cement single sheet – (Element Ref: 80623042, 806230422, 806230447, 806230450). Main contractor on the project was Tolent Construction Ltd. and the cladding was installed by Alderclad Ltd. of County Durham. 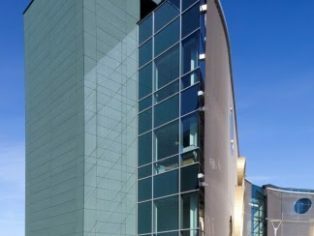 The Northern Design Centre project was led by Gateshead Council and private sector developer Terrace Hill, with the funding secured through regional development agency One North East. It offers exhibition space, conferencing facilities, training areas, workshops and incubator space for start-up design-based firms.